I must admit, I love the look of eggs. Even before they started popping up everywhere in the Atlanta showhouses, I collected antique egg prints from ebay and Scotts Antique Market (a monthly antique market in Atlanta). This is an example of an egg print. I prefer the eggs from A Natural History of the Eggs and Nests of British Birds, by the Reverend F.O. Morris (1810-1893). He published several volumes of these works, all of which utilized woodblock engravings of intricately drawn eggs and nests. The engraver was Benjamin Fawcett, one of the most accomplished British woodblock printers of the 19th century. 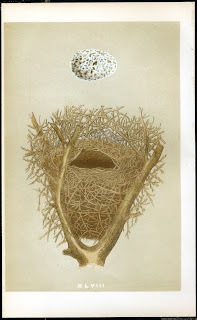 The illustrator was Alexander Francis Lyndon, who captured the minute detail of the eggs and nests of many species on the British Isles. Each engraving was hand colored by a team of women colorists who were closely supervised by Fawcett. This one is an egg and nest print. I love the look of these too. Some people prefer the look of the eggs alone, but I love the look of the nests in combination with the eggs just as much. I have a large collection of nests and egg prints waiting to be framed. I do not have the perfect place for them in my current house, so this project may wait awhile. There were a number of editions published through the years, and the numbering system and format changed a bit from edition to edition. Typical of original pages from antique books, the background color can vary dramatically when prints are not from the same book, so the buyer must keep this in mind when purchasing antique prints. Sometimes prints have signs of bookworm or discoloration. When purchasing prints online or on ebay, the pictures usually reveal any imperfections, but the coloring of the paper is often hard to see. Whenever I bought a batch of these antique egg prints, I always expected that a few would not really be usable. Out of the 35 or so that I collected, only 12 were really suitable for framing. The egg prints look beautiful when framed as a set. The eggs have a simple graphic quality that is quite modern, yet timeless at the same time. The prints are beautiful and I love your collection! See, you were ahead of the curve on egg prints- good eye! 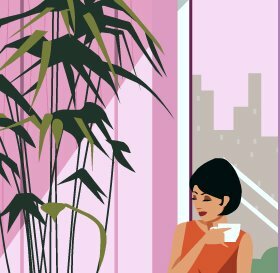 I share your love of eggs and like themes in print and design- also like visiting the popular ATL haunts, so follow your blog when I have time. I'll have to stop back and read your post on finishes when I have more time. Love those prints! 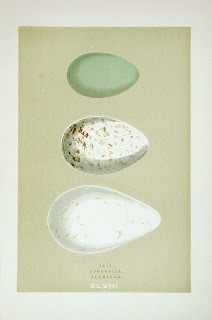 I love egg and nest prints, as well as vintage bird and botanical prints. They look marvelous framed in a group like the picture you showed. I have always wanted to go to Scotts and Lakewood (lakeland?) flea markets in Atlanta and plan on doing so this summer. I live in NC near Asheville so it is only about a 4 hour drive. Which would you recommend for the best deals and most stuff? p.s. I am having a giveaway, please stop by! They are quite charming...I've never seen these around, but they look lovely framed as you have them. Penny, Lakewood closed down last year. I heard the property was sold. This means that Scott Antique Market is the only option! It is huge - there are two enormous buildings, one on either side of the highway, and a shuttle that takes you between the two. It definitely takes an entire day if you want to do the whole thing. What gorgeous prints. I often come across such things on my wanderings (like you, on ebay) but I tend to resist, anxious about framing costs and so forth. Nevertheless, I have a number of gorgeous large architectural prints for which I got lovely simple habitat frames, which are unfortunately gathering dust in our attic in Ireland until we move to the UK next year! Have you ever looked at the New York Public Library's collections on-line. THey've digitized their ephemera collection. Some great pix of eggs (one of which just printed off). Pigtown, it is interesting you mention this, because when researching this post I came across the NY Public Library edition of Morris' Nest and Egg books! Luckily, I did not spend a fortune on the antique prints! Passementerie - you are right, framing is quite an investment. These frames cost quite a bit considering I was framing 12 prints! But, every single day I look at these prints and think about how lovely they are. To Passem... I had to frame 16 pictures for my office. I found some great black frames at the $1 store and they're even double matted! Check Tesco or Asda for some frames, or even Ikea, if there's one near you. I love egg motifs too! This wall of displaying your egg prints is just gorgeous! So great to come across this post! I just bought 3 matted egg prints Im going to frame. I love them!